If you've ever shied away from considering a city wedding, then these two venues will make you think again. Gibson Hall is a converted banking hall located in the heart of the City of London, with its own secluded garden (see pic!). The grandeur of the main hall and the peacefulness of its courtyard garden create the perfect blend of town and country. 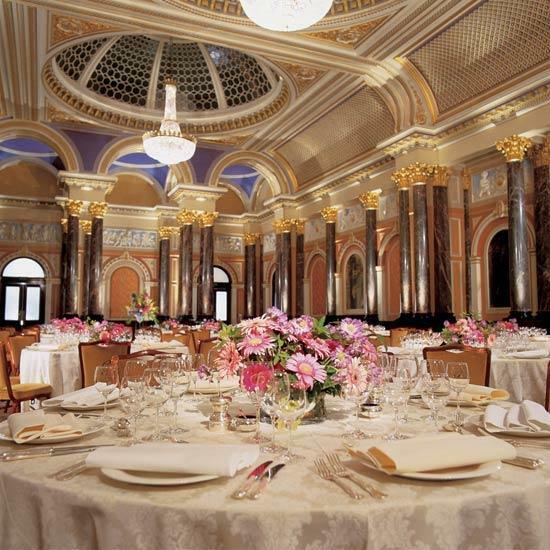 The Main Hall is absolutely gorgeous with its stunning chandeliers hung from a glorious domed ceiling. It's large enough to accommodate a stage and entertainment alongside the dinner layout, and depending on our requirements a whole range of different concepts can be created with lighting, draping, theming and table centres. We really love the flexibility of this! They offer many different wedding packages, and you can find out more by visiting their listing on the site.